Kiki Bertens in action against Julia Görges. Photo: Tim Ireland/AP via HH. 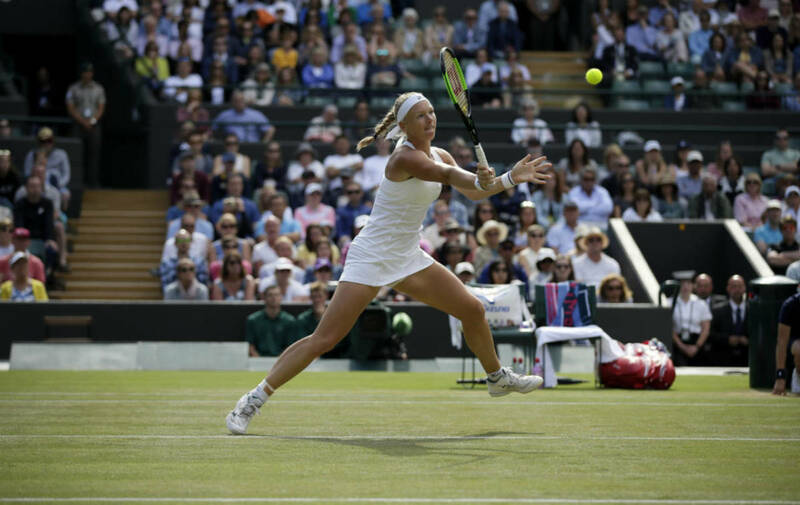 Kiki Bertens’s dramatic run at Wimbledon ended in the quarter-finals on Tuesday as she lost in three sets to Germany’s Julia Görges. Aiming to become the first Dutchwoman to reach the semi-finals since Betty Stöve in 1977, Bertens took the first set and seemed to be heading for a tie-break in the second after recovering from a break down. The 26-year-old from Wateringen edged 15-30 ahead on Görges’s serve at 5-5, but was unable to take the game to match point. Bertens won just one more game in the match as Görges found another gear to take the second and third sets for a score of 3-6 7-5 6-1. The result deprived Bertens of the chance to take on Serena Williams after beating her sister Venus in the third round. In the following round she defeated the Czech seventh seed Karolína Plísková, like Venus Williams a top 10 ranked player, to become the first Dutch singles quarter-finalist for 11 years.